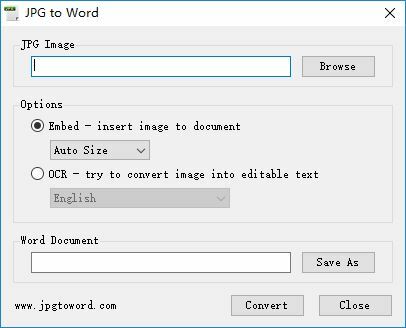 JPG to Word is a free file converter to convert JPG/JPEG images (*.jpg) to Microsoft Word documents (*.doc), it supports two conversion options: Embed method and OCR (Optical Character Recognition) method, you can use it as a convenient JPG to DOC file converter. This software can run without Microsoft Office. In addition, it is completely free to use. This software is easy to use, select a JPG image and choice a conversion method, then hit button "Convert", that is all. The default method is Embed method, software will embed whole image directly into Word document, you can control image size, there have five options: "Auto Size", "Max Width", "Max Height", "Stretch" and "No Change". 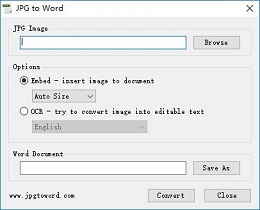 The second method is OCR method, software provides text recognition function and can support multiple languages, it will try to extract text in picture and convert to editable text. Software use Tesseract, a free and open source OCR engine, it supports English language by default, if your files are not in English, you can select another language, software will automatically download appropriate language data from this software website, you just need to keep a connection to the Internet. If you have download some additional language data, before you uninstall this software, you can use button "Remove" to delete these language files. Microsoft Office and Microsoft Word are trademarks by Microsoft Corporation. Copyright © 2014 JPGTOWORD.COM, All Rights Reserved.